Cream shortening and sugar together. Beat in eggs. Stir in milk, vanilla and salt. Mix in flour. Work the dough with your hands for a minute before rolling out. 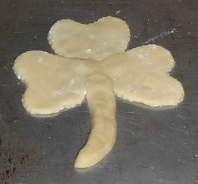 Roll out the dough to 1/8 inch thick. Use flour as needed to roll out the cookies. Bake in a 350 degree oven for 12 minutes, or until golden brown. Immediately remove the cookies from the cookie sheet and allow to cool. 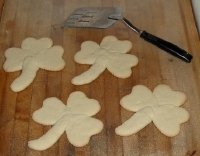 When the cookies are cooled thoroughly, frost with shamrock icing. For added decoration, use cookie sprinkles, if desired. Measure the powdered sugar into a mixing bowl. Work the butter/margarine into the dry powdered sugar with a mixing spoon. Add salt and vanilla. Add the milk 1 tablespoon at a time and mix thoroughly after each addition. When the icing is finished, add the food coloring and mix thoroughly.